Traxxas LaTrax Aluminum (Blue) Oil Filled Adjustable Shockes Discounts Apply ! 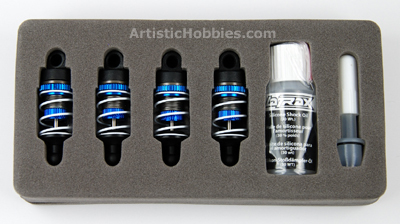 TRA7560X - Traxxas LaTrax aluminum (Blue) oil Filled adjustable shockes. Threaded shock bodies with springs. Includes 4 shocks with oil. NOTE: Shocks are empty and must be filled with oil prior to use.